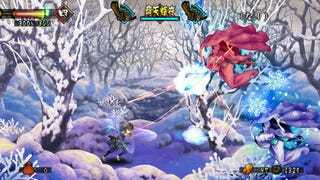 Vanillaware's Muramasa: The Demon Blade is a lovely looking side-scroller. But it could be even lovelier at higher-than-Wii resolution, an option not out of the realm of possibility, according to studio founder George Kamitami. He tells Gamasutra that Muramasa: The Demon Blade's assets are created at double the size of what we'll see in the Wii version, noting that "producing a fully HD title would not be a great deal of extra work for us." He's not promising anything, cautioning that making Muramasa hi-def ready "wouldn't be a simple insert." He's just being honest. It's something that Muramasa: The Demon Blade's Japanese publisher Marvelous Entertainment probably wouldn't see be sad to see. Marvelous has said it may bring some of its Wii games to the PlayStation 3 and Xbox 360, a move that may help eke out more profit from its lower than expected performance on Nintendo's platform. Kamitami, of course, touches on a number of topics not related to upscaling its games for more graphically capable platforms, which you should read for yourself at the full interview.